This chapter details how President Kennedy’s revised foreign policy structures helped him successfully resolve the Cuban Missile Crisis. It argues that the crisis was the ultimate test of Kennedy’s leadership. 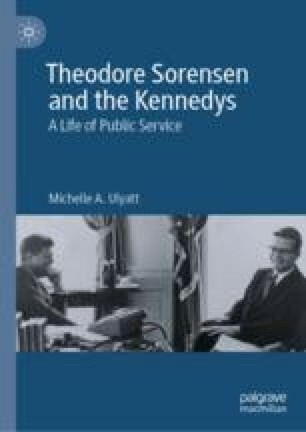 Further, the chapter highlights the important part Sorensen played in assisting the president to handle the crisis effectively. It details Sorensen’s role in crafting the president’s speech to the nation at the height of the crisis and his impact on the decision-making process during the deliberations that determined the administration’s response. The chapter examines the impact of the crisis, arguing that during his final year in office, Kennedy’s foreign policy approach shifted to focus on the pursuit of peace. It also explores the contradiction between this new approach and the ongoing US involvement in Vietnam. Kennedy, John F. 1962. “Radio and Television Report to the American People on the Soviet Arms Buildup in Cuba, October 22, 1962.” John F. Kennedy Presidential Library and Museum. https://www.jfklibrary.org/Asset-Viewer/sUVmCh-sB0moLfrBcaHaSg.aspx. ———. 1963. “Commencement Address at American University, Washington, D.C., June 10, 1963.” John F. Kennedy Presidential Library and Museum. https://www.jfklibrary.org/Research/Research-Aids/JFK-Speeches/American-University_19630610.aspx. ———. 1963. “Remarks of President John F. Kennedy at the Rudolph Wilde Platz, Berlin, June 26, 1963.” John F. Kennedy Presidential Library and Museum. https://www.jfklibrary.org/Research/Research-Aids/JFK-Speeches/Berlin-W-Germany-Rudolph-Wilde-Platz_19630626.aspx. ———. 1964. Interview by Arthur M. Schlesinger Jnr. John F. Kennedy Presidential Library and Museum. April 4, 1964. https://www.jfklibrary.org/Asset-Viewer/Archives/JFKOH-RSM-01.aspx. Shenon, Philip. 1990. “Ex-Kennedy Aides Ask Release of ’62 Crisis Papers.” The New York Times, October 14. https://www.nytimes.com/1990/10/14/world/ex-Kennedy-aides-ask-release-of-62-crisis-papers.html. ———. 2001. “The ’13 Days’ Taught Seven Truths.” Los Angeles Times, February 1. http://articles.latimes.com/2001/feb/01/local/me-19632.